Coconuts fruit food pictures, photos, images. The coconut (Cocos nucifera) is a member of the family Arecaceae (palm family). The coconut palm is grown throughout the tropics for decoration, as well as for its many culinary and non-culinary uses; virtually every part of the coconut palm can be utilized by humans in some manner. The nut provides oil for cooking and making margarine. The white, fleshy part of the seed, the coconut meat, is edible and used fresh or dried in cooking. The fleshy part can be dessicated to produce coconut milk in making curry dish and other dishes using coconut milk. The cavity is filled with coconut water, which is sterile until opened. It mixes easily with blood, so for this reason it was used during World War II in emergency transfusions. It contains sugar, fiber, proteins, antioxidants, vitamins and minerals, and provides an isotonic electrolyte balance, making it a nutritious food source. It is used as a refreshing drink throughout the humid tropics, and is used in isotonic sports drinks. It can also be used to make the gelatinous dessert nata de coco. 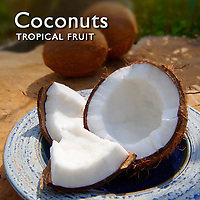 Mature fruits have significantly less liquid than young immature coconuts, barring spoilage. Coconut milk is made by processing grated coconut with hot water or milk, which extracts the oil and aromatic compounds. It should not be confused with coconut water, and has a fat content around 17%. When refrigerated and left to set, coconut cream will rise to the top and separate from the milk. The milk is used to produce virgin coconut oil by controlled heating and removing the oil fraction. Virgin coconut oil is found superior to the oil extracted from copra for cosmetic purposes.